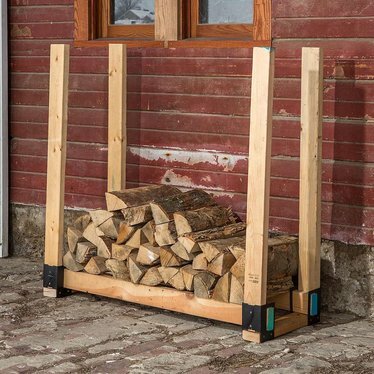 Build a log rack to your precise needs and specifications in just a few minutes. Durable steel brackets are easy to assemble - no hardware required - all you need is a few 2'x4's (you supply). Keeps logs up to 5" off the ground to prevent rotting and to protect them from insects. 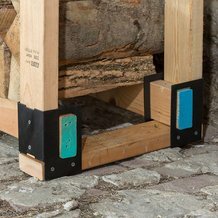 Create any size log rack with these handy, removable brackets. Firewood dries faster for easier, safer burning. *You'll need multiple packs to build this project. The amount of brackets needed depends on the size you're building. For making racks longer than 4 feet, add an extra flat 2"x4" to provide support to the lumber in the rack. well worth the price,very well made,no wobbling/tilting/buckling plus you decide if wood stack is short/long+height-have been using same brackets for yrs. Very handy for stacking and if you attach the brackets with nails and then flip it over you have an inexpensive work bench and you can make it just about any length. Vermont is a perfect place to send these brackets. It was a gift to my daughter who lives in a small cabin heated by a wood store. She shleps her wood in, taken from our own land, and has had many years of stacks falling down. This year her wood stood tall and proud, easily protected with a tarp from the snow, and since it allowed a slanted pile, the snow for the most part just slid off! What a great product. We have, we think, sold a few more by word of mouth to others like us who love Lehman's for practical eco sound green products.